In our latest episode of the “I am a Mainframer” podcast, Steven chats with Andy Youniss from Rocket Software. Andy co-founded Rocket back in 1990, and has served as CEO for nearly 30 years. 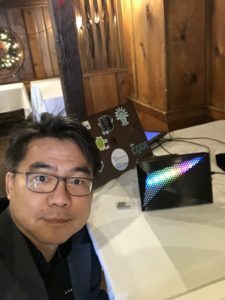 Andy describes how he started Rocket with a college roommate, the company’s growth and his thoughts on why mainframe is still the go-to infrastructure in 2019. Steven: Hello my name’s Steven Dickens and you’re here on the I’m a Mainframer Podcast from the Open Mainframe Project. I’m joined today by Andy Youniss and I’m really looking forward to our conversation. Andy’s from Rocket Software, and thousands of companies depend on Rocket Software every day to solve their most challenging business problems by helping them run existing infrastructure and data, as well as to extend those assets to take advantage of Cloud, mobile analytics, and future innovations. Andy is joining us as I say, and he was a co-founder of the company back in 1990 and has served as the CEO for over 30 years. Thanks for joining us Andy, great for you to be here. Andy: Thanks for having me. Steven: So Andy, we’ve known each other for a few years now, I’m looking at the introduction that the teams given me this, and just some fantastic things. I didn’t realize that you’d been the CEO with Rocket for 30 years and were a co-founder. So maybe lets start there, could you just tell me a little bit about that and how this business got into mainframes and kind of get us orientated to get us started? Andy Yeah, going all the way to 1990, I had worked for a small start up company here in the Boston area. We were building mainframe products, products around the mainframe. They were solving really interesting problems for mainframe customers. This small start up company I worked for got bought out by a larger company down in Washington, D.C. I wanted to stay in the Boston area and I had some ideas of new products, new solutions to bring to market, and so I started Rocket with a colleague of mine, and from the very beginning we made some important decisions. One is that we were going to begin our journey, begin Rocket Journey in the mainframe space. We knew the customers well, we knew the technology well, and we knew the types of problems that those customers wanted solved. We also made a very important decision from the very beginning to partner with IBM. Back in 1990 we could have made other decisions, but we really wanted to stay close to IBM and IBM customers, and so those two decisions about “lets make sure we start with our footing in the mainframe space”, and “let’s make sure we start with being a good IBM partner”, those really set the direction for Rocket for the next 30 years of our journey. Steven: Well I’m looking here, it started out from you and a colleague, and now you’re up to over 1500 employees. That must have been a pretty wild ride over the last sort of 30 years. Can you kind of give us some commentary of what that’s been as you’ve grown to that sort of size and scale? Andy: Yeah, we started here in the Boston area, and we started hiring engineers. We were going to be a very engineering centered company, and that’s my history. I’m a software engineer, and I actually first got introduced to mainframes in the early ’80s after I graduated from college. I knew when we built Rocket, we were going to be good at a few things. One was we were going to be good at engineering, we were going to build really good products, and we were going to be good to engineers. We were going to treat engineers well. So in our early days we were hiring engineers, we were small and we were not venture backed. We bootstrapped the company and grew as fast as we could bring on our next customer. So we grew slow and steadily and there was a time where we needed more engineers and we just couldn’t hire them fast enough. We decided maybe a strategy would be to acquire businesses that had good engineers, good engineering talents, and good products. So one of the first things again (we did) was acquire local, Boston based businesses that had good engineers, and good engineering talent. That’s one way that we have been able to grow not only our customer base and our product set, but our Rocketeers. So our growth from zero to 1500 engineers has happened organically, but it’s also happened inorganically through our acquisitions, and we’ve acquired and grown all over the world. So even though we’re here in Boston, we have engineers in many locations including India, We have a couple of labs there in China, in the Netherlands, all throughout Europe, in Australia. So it’s been global growth and we’ve been finding great engineers and engineering talents all over the world. What’s also interesting is sometimes we acquire engineers with really strong mainframe skills, but most of the time we’re hiring good engineers, introducing them to the mainframe and they’re doing amazing things in that technology landscape once we unleash their capabilities onto that just awesome platform. So our growth has been interesting, acquiring mainframe talent and just really good engineering talents and just letting them learn and grow in the mainframe space. Steven: Well that’s interesting. From the way you describe it, mainframe’s been at the core of the business for 30 years, still the core of the business today. We obviously get a lot of feedback, and the industry’s got a perspective on mainframe and part of these podcasts are trying to reshape that perspective. But why are mainframes from your perspective, still the go-to platform, go-to tool, go-to sort of infrastructure for so many of the industries that we see them deployed in? Andy: So I obviously hear this a lot, and talk a lot about this. When Rocket started in 1990, I did receive a lot of advice, an overwhelming amount of advice that it probably didn’t make sense to start a mainframe centered company around the time when client server was all the rage. My server was the next big wave and you can imagine over the past 30 years, multiple other waves have come and gone, and the general wisdom is you probably shouldn’t continue to focus on mainframe; but we look at it very differently. As others have run away from the mainframe, we’ve actually intentionally run toward the mainframe. The reason for that is, instead of looking at general wisdom and theory and potentially large macro-trends, we look at our customers. Our customers primarily are large, global businesses. They’re focused on financial services, or insurance, or re-sell, or manufacturing, or even government services, and companies, enterprises of those shapes and sizes, and continue to do a lot of their core business on the mainframe. Over the past 30 years, the use of the mainframe in those enterprises has grown. So the number of mainframes today may be less than what it was 30 years ago, but the amount of transaction processing, the amount of data, the amount of critical business data in operations still flows through the mainframe. Steven: Why do you think that is Andy? Why do you think people are still kind of relying on this platform, if you will? I mean I know the answer to that, I’m sure you know the answer to that; but I think our listeners would be keen to get your perspective, why are people still seeing this as a platform that can do things that other systems can’t? Andy: Yeah, as you know it’s multiple vectors, and you can start with any one of them, but certainly something that you hear a lot about lately. Especially since the new D14 was launched, you hear people talking about this more, you can say it starts at security. The mainframe is a trusted computing platform, it’s extremely, implicitly trusted in large enterprises, the transactions that flow through mainframes are secure. The data that flows through and is stored on or close to the mainframe is extremely secure. The horsepower on the mainframe that allows you to secure it, encrypt it, protect it is something that is really unparalleled. So it can kind of start there if you’re in an industry, if you’re in a business where it’s absolutely mission critical that the data, the transactions, are absolutely secure. Mainframe is really unlike anything else out there. But it can also be about reliability. It can also be about availability. It could also be about scalability, and so again, depending upon how you want to approach it, the mainframe certainly provides all of that and more. So I think that’s historically what’s happened, is these large transaction processing systems, large amounts of data, I mean mainframe did big data before big data was even called big data. So all of that is why the mainframe is what it is, and then there’s so many interesting things happening now with mainframe that will ensure that it will continue to be, not only viable, but mission critical into the future. Steven: So I mean if that’s the good news story, and obviously you know I subscribe to that view of the world, what’s the challenges? If that’s the pros column, what’s the cons column? What’s the challenges you see for the platform? Andy: The challenges in many ways are self imposed by history and by the members in the ecosystem, people who are part of the mainframe ecosystem. What I mean by that is, we’ve all heard for so long, the mainframe is going away, et cetera, et cetera, and so you see companies saying, “Well I can’t buy mainframe skills. I can’t hire people that know the main fame.” It’s within my IT organization, my employees would rather work on something more, I’m putting quotes around this now, “Something more modern than the mainframe,” and so it’s this self fulfilling prophecy that the people have imposed on themselves; but the fact is the mainframe is as modern as any other computing platform. The mainframe is now as open as any other computing platform, we see that at Rocket, you don’t have to be my age in 30 years to be experienced with the mainframe. You can be in high school or come out of university, and be extremely productive on the mainframe right away, because all of your favorite languages and tools are there. Now, that doesn’t get a lot of press, there isn’t a lot of marketing around that, it isn’t widely known, but if you are a data scientist, all the data science languages that you want are on the mainframe. In fact, all the data that you want to analyze is on the mainframe and so what a perfect marriage? Why do I need to move that data somewhere else, wait for it to get there, hope it gets there in time, or in the right way, and integrate it with everything else appropriately so I can do my analytics when I can do it right on the mainframe itself? So kind of a long answer to the myth around this it’s hard to find skills, it’s hard to find people, I need to transform my IT organization because I can’t do what I need to do on the mainframe, all that has really changed I would say over the past decade, over the past 5 years, certainly over the past few years; and again we prove that every single day at Rocket. We bring on new Rocketeers who are young, who are smart, who are incredible computer scientists, and we let them apply their skills in this amazing mainframe space and they’re productive and they do amazing things very quickly because that platform is as modern as anything else. Steven: Yeah that’s interesting that a lot of what you said resonates for me from that kind of open source movement, that’s where a lot of the, if you will call them college kids, and younger professionals are kind of getting into the world of computer. They’re getting into that kind of open source movement, and obviously that’s why we open Mainframe Projects three years ago now to kind of intersect that part of the market. Rocket’s a relatively new kind of member of the Open Mainframe Project, obviously as the CEO can you kind of give us a sort of brief description of where you see Open Source? How you see a community? Kind of what role you see the Open Mainframe Project playing in that? 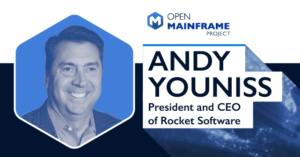 Andy: So, Rocket has been bringing Open Source to the mainframe for many, many years. We actually started boarding popular languages and tools to the platform over five years ago. But only recently have we joined the Open Mainframe Project, and so I think we’ve been doing some work and I feel so good because now we’ve found kind of a home. We’ve found our community within the Linux Foundation, within the Open Mainframe Project. We’re now connected with other people in the ecosystem who think the way that we do, which is that we need to bring more and more open source to the platform for the good of the ecosystem, for the good of the community. So, yeah we’re relatively new to the Open Mainframe Project, we’re thrilled to be a part of it. We probably should have found it earlier, I don’t know why we didn’t but we didn’t and now we’re here, we’re very happy that we’re here, but we absolutely believe that for the future of, really of any platform right? But mainframe for sure, openness is the key; and I guess what I find really interesting is, and again I’ve been in the space for 30 years, more than 30 years, is the members of the mainframe community, if you will, have been asking for openness for quite a while. Now with the Open Mainframe Project they’re getting it, it’s available to them, and on the one hand as an observer, it’s interesting to see how quickly the community will embrace this openness, and then what the community will do with it, and where they will bring it next. Historically in the mainframe world, the users of the mainframe looked at the software vendors to tell them what’s going to happen next. That’s kind of reflectively the motions worked forever, you know 30, 40, 50 years in the mainframe, now it’s flipping, which is the community can decide on it’s own where it goes, and use open technology to ride in that direction,. So that’s a new motion for the community and it’ll be very interesting to see how quickly it get adopted and exploited. Steven: One of the interesting developments for me, and I was at the pleasure of being asked to share in St. Louis when Zowe was launched, but as you say, it’s how do we bring open source in that community, sort of crowdsourcing of development and stewardship of a code base to what has been probably the most closed platform over the decades sever wise. And I think for me, that intersection of the two is really interesting, how an operating system with such rich history and has been developed so tightly in the past, is not embracing open source and that sort of crowd source community developed roadmap development, kind of focus that comes from how open source is developed. So, I’d really be keen to get your view of kind of why did Rocket see Zowe as something that was really interesting? Is there a kind of manifestation of open source and severless? Why were you guys interested, why were you so keen to join, and maybe where do you see things going, if you can give me that as a perspective Andy? Andy: Zowe, as you said, was really kind of announced and launched August of last year, August of 2018, but we had been working on what would become Zowe two years prior. It really came out of conversations we had with many customers, all different industries, all different geographies looking for kind of common platform capabilities that cut across products, and cut across vendors, if you will. And at the same time I know within IBM there were similar conversations and I know at the time within CA there were similar conversations and the three of us got together and said, “What if we brought all of this together and made it open for the good of everybody? For the good of the community?” So that’s kind of how it started, we were big believers in it. we were hoping we could get others, and we were so thrilled that IBM and CA looked at it the same way, now that Zowe is launched, it exists, it’s real. By the way, the Open Mainframe Project is the perfect vehicle from which to launch this thing. So, I mean the timing couldn’t be more perfect, and so now we’re looking for other like minded people who want to not only consume, but contribute to Zowe. So the more of us that embrace Zowe, the more of us then will have ideas of where Zowe goes next, and maybe it will be more about user experience, and maybe it will be more about CLI or maybe it will be more about APIs or maybe it will be about all of that. The good news to me is the community gets to decide where it goes and then we all focus our efforts on that. Steve: Yeah, and that’s one of the questions I always like to ask in these podcasts. So I give you a crystal ball, I give you the ability to look say three or five years into the future, where do you see us landing? So what would Rocket software, the kind of open ecosystem, around the mainframe look sort of three to five years out? Where do you think we’ll end up? I think that’s the real game changer here, Zowe is going to allow the mainframe to part of that conversation, where over the past decade it just wouldn’t have been considered. Just think about it, data science can happen on the mainframe, not just because some small sector within the IT organization believes in it. But because the entire organization believes the mainframe is capable of delivering that type of value to the business, because all of the openness is there, so I think that’s looking back, five years from now looking backwards we’re going to say it all started in August of 2018 with Zowe. Steve: Okay, that’s a fantastic perspective, and that’s where I see us ending up Andy. So, I try and as I look to wrap up, kind of ask that crystal ball question of where we’re looking going forward. Then I’d like to ask a question of I guess on the show, what would have been your advice if you’d have had the time machine to kind of go back, and I’ll pick 30 years ago, as you were starting Rocket, what advice would you have given to the 30 years younger Andy Youniss as he was looking to sort of found Rocket and start things out, what would be your advice to your younger self? Andy: My answer is have more conviction about what you’re doing, again, we started this mainframe company in an era where everybody was focused on other things. It took us a while to really have the confidence to say, “You know what? We absolutely love the mainframe.” Our customers knew that, our employees knew that, our friends at IBM knew that, but we really didn’t tell that story loudly; but we have recently. We absolutely love the mainframe, we love the mainframe customers, we love the mainframe community, and we’re not afraid to say that. I think if we had that confidence and conviction to say that 20 years ago, 25 years ago, that would be the advice I would give my younger self, like we knew it, we knew this was the right place to be. We knew this was the right place to make our investment, we were kind of quiet about it for a little bit too long, and now we’re not afraid, we’re not bashful about it. We love the mainframe, we love the mainframe space, and we’re going to do everything we can to continue this journey that we’re on to make the mainframe this first class participant in every IT discussion and every business around the world. Steven: Andy in that last answer, you probably encapsulated everything I would have said in wrap up for our conversation today. That love of the mainframe platform, the desire for that to exist in an open source community and for us to plan forward to bring new people into this platform and enjoy working on the platform as much as you’ve obviously enjoyed it over the last three plus decades. Andy it’s been absolutely spectacular to talk to you today, really enjoyed our 30 minute conversation. Is there anything you’d say as we wrap up? Andy: Steven, I always appreciate when we get together and talk. Thank you for giving me this opportunity, and I look forward to continuing the conversation, we’ll I’m sure be together at IBM THINK in San Francisco in February and until this best of everything, we’ll see you in a few weeks. Steven: Fantastic, thank you very much. So that’s been Andy Youniss from Rocket Software, the CEO talking us through how Rocket is investing it the mainframe space, how he sees the business going forward, and gave us both a look forward five years, and a retrospective of the fantastic history of Rocket over the last 30 years. My name’s Steven Dickens, you’ve been listening to the Open Mainframe Podcast. Please join us for next episode by clicking subscribe, and thank you very much for your time today. In our latest “ I am a Mainframer” interview series, Steven Dickens, WW Sales Leader – LinuxONE at IBM, chats with Sujay Solomon. Sujay has been in the Mainframe industry for 8 years. With an array of experience in technical leadership roles such as z/OS system software development, web development and product management roles, he is now leading CA’s initiative to modernize the Mainframe for developers. Steven and Sunjay discuss the business processes and business that the Mainframe platform is supporting, Zowe and the future of the Mainframe. Steven Dickens: Good day. 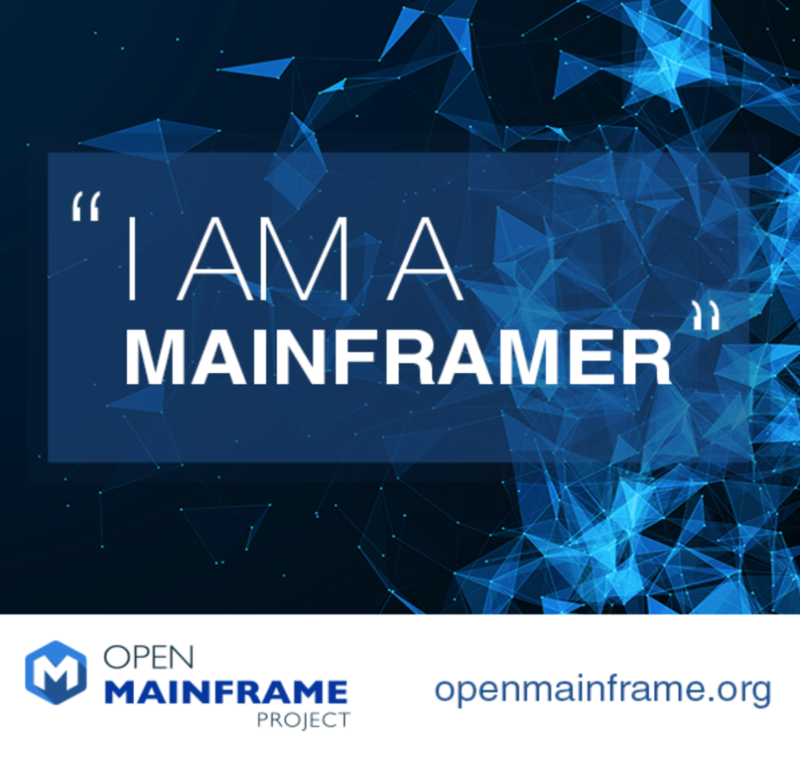 I’m Steven Dickens and it’s my pleasure to host another edition of the I’m a Mainframer conversation series, sponsored by the Open Mainframe Project. 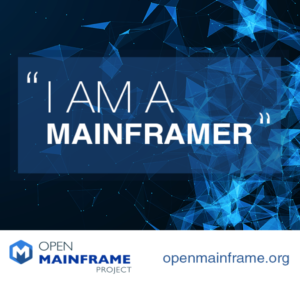 As a Linux Foundation project, the Open Mainframe Project is intended to help create a Mainframe-focused open source technical community focused around collaborative engagement on the Mainframe platform. I’m joined today by Sujay Solomon from CA. Thanks for joining us, Sujay. Sujay Solomon: Thank you, Steven. Happy to be here. Steven Dickens: Sujay, this is all about why you’re a Mainframer. If you can just get our listeners a little bit orientated and tell us a little bit about yourself and give us some background. And really first off try and understand what makes you a Mainframer and what makes you so passionate about the platform. Sujay Solomon: Sure. I am, I’m actually a Product Manager now, so I haven’t been writing code for a little while. But what attracted me to the platform was I went to Penn State for computer engineering. And that degree is interesting. It’s somewhat of a marriage between computer science and electrical engineering. You do a little bit of hardware and you do a little bit of software. And it kind of meets in the middle. Because of that background from Penn State I was interested always in doing and working on things that powered the back end of things. The engine, if you wish. And I, right out of college I actually worked for a start-up where I was designing and building code for microcontrollers. And it just happened to be that that was being done in Assembly language, believe it or not. And then I saw an opening in Penn State’s career website that said there’s a position for a software engineer at CA Technologies in Pittsburgh. It might involve a decent bit of Assembler for that programing and I said, “You know, I like what I’m doing now.” I didn’t really know about Mainframes but I just went out and Googled Mainframe a little bit. And then I found out that there’s all these very important technologies and businesses today that run with the Mainframe as their backbone. From what I had heard about Mainframes in the past, from movies and such, was that they need to be hacked because they’re very important. Until I did some bit of research I didn’t know what they actually did. But then again I considered it, I looked at it and I mean it was a very stable platform that had been around for a very long time. I said, “Why not? Let’s go and interview for this. I’ve had my year of fun with start-ups, let’s go and look for something that’s more long term.” That’s how I got started with the Mainframe platform. Steven Dickens: You started out as an Assembler programmer and that’s what drew you into the platform, is that a good summary? Sujay Solomon: Yeah, absolutely. It’s the fact that when you’re developing code at that level you need a very clear and good understanding of how the system works at an operating system level. And maybe even at the hardware level. But you still have to have your fundamentals of writing software and developing code in a good place as well. I liked that aspect of it where I wasn’t writing a whole lot of high level, abstracted code and I was doing more coding that was very close to the operating system and the hardware. That’s absolutely what attracted me. Steven Dickens: Keen to get a view underneath that a little bit. I mean, you obviously learnt Assembler, you came out of college, got into that start-up, were writing that code close to the hardware layer. Tell me a little bit more about that transition as you went from that world to the Mainframe world. Was it an easy transition for you to make? I think a lot of our listeners would be interested to understand how you made that transition. Sujay Solomon: Yeah. My response here is usually a little bit different from what I’ve heard from others. I actually didn’t have much of an issue. It’s, Mainframe is just another computer. And the architecture that’s followed in the Mainframe platform is well defined and actually one of the common architecture that’s followed even in other platforms. To me, learning about how a computer works at its core was very key at Penn State. And their curriculum was such that they didn’t focus much on specific languages or specific technologies. It was more so concepts that drive how computing works. And that really helped me when I joined CA and we were doing a lot of development and operating systems level things. And it was really enjoyable for me because it was really the concept that I was learning. And then actually putting them to work from what I learned in college was way more interesting to me than what language I was writing the code in. The transition for me was fairly easy. Especially when it comes to the language. I had no issue with picking up high level Assembler as opposed to writing in the microcontroller Assembly language I was using previously. I did do quite a bit of C-programming as well. Along with Assembler on the Mainframe. And again, both are languages that I really enjoy writing in. The concepts in Mainframe when it comes to, say, things like cross-memory posting, managing your virtual storage, topics like that, they were challenging but it was also very, very interesting. That’s what drew me in and kept me here is the technical complexity of the platform when it comes to writing very efficient code. And you having full understanding of what you’re writing and how the machine’s gonna actually interpret that and run that for you. Steven Dickens: I’m just, as I was prepping for this Sujay, was looking at your profile on LinkedIn and looking at the eight years or so you’ve been at CA. Pretty stellar rise through the ranks there from a software engineer through to your current role. Can you just give these listeners a view of what you’ve been involved in, some of those interesting projects. And really a whistle-stop tour through your time at CA. I think the listeners will find that really interesting. Sujay Solomon: Sure. Just to go back to your previous question, you asked if moving to the and working in a Mainframe platform was challenging. The technology itself wasn’t really challenging but the expectations in the Mainframe world were quite challenging. I was maybe two weeks into my job and I worked on a performance management product which was quite key at CA. And they had me look into an issue that the customer had opened. And I worked it out, I came up with a fix and I wrote a PTF which you can consider a patch and another technology, right? And I released that not as a public thing, but as a closed off fix for just one customer. And I get a call directly from one of the Directors of Mainframe in that company and he’s drilling me over intricate details of the fix that I wrote. I certainly did not expect that. But trial by fire like that really put me in a place to understand how important this platform is for people. And the fact that somebody that high up in their organization was technically proficient and looked at a fix and was concerned and then he called me up directly to ask questions about how it was implemented … That opened my eyes as far as how important this platform is. And going forward I work on other products that even plug directly into the operating system. And if you’re, say, opening up a data set on the Mainframe and somebody else is opening it up at the same time there’s serialization issues that can occur. I actually worked on quite a bit of operating system exits that would handle serialization issues like that. One of the times we, a large bank in Europe was having some issues with ATMs. And they didn’t really know what the issue was but they essentially said, “Hey, CA. We have your software. IBM we are using your platform. You guys work together to sort this out. We don’t care what the problem is but we need our ATMs to be back and running right away.” That involved being on bridge calls with the customer, with other vendors for many days straight. Across weekends, even nights and then we all worked together to solve this issue because this was a customer who was really dependent on the Mainframe. And as vendors who create software and hardware for the platform we all work together to solve issues like that. That sort of experience was rewarding for me. It’s solving real world problems that touch people lives every day. It’s just working on the software that runs it. Steven Dickens: Yeah, and I think that’s obviously a challenge we’ve got as we position the Mainframe out to different audiences. It’s, as you mentioned in one of your statements, the box at the back end. It’s not front and center for a lot of our clients. It’s the box that never falls over at the back of the data center that just runs the business. I mean, have you seen that as you’ve engaged? That critical, sorry, criticality to clients? And if you could maybe give a CA perspective on some of the business processes and business that this platform’s supporting, that’d be interesting, I think. And you just have to get on that call and get to it because as minutes go by with their Mainframes not working, they’re losing maybe thousands, hundreds of thousands or maybe even millions of dollars in business. With just a few minutes of the Mainframe not operating. That’s the level of importance that the industry has on the Mainframe platform. And CA absolutely has so much process in place. We have rotations of folks who are gonna be on call. And multiple layers, even, or a certain person who’s maybe in Support gonna get called first. And then if they’re not able to solve it they have multiple levels of escalation and everybody’s number is on file and they can get called at any time. That’s part and parcel of working in an environment and an industry like this where you’re really key when it comes to continuing the business operations. And to me that’s actually rewarding. I don’t see that as a burden. I see that more as, hey, the key businesses in this world rely on our technology being highly available. And we are the people who help make it highly available if it ever runs into issue. That’s very rewarding. Steven Dickens: Yeah, I think that’s just part of being in this Mainframe space. There’s a different code, if you will, around what it means to be a Mainframer and what it means to support these clients. It’s good to get that perspective and I think it’s interesting to hear you say, and I certainly feel this way, is we’re supporting these clients. That’s a good thing. You feel like you’re giving something back and there’s … The world runs on these platforms so to be involved in them is a positive thing. Looking ahead Sujay, there’s some interesting stuff going on right now as we look at the Mainframers and overall platforms. Some fantastic announcements at SHARE recently. Can you just give me your view of where you think open source and the Mainframe platform come together? And really how you see that shaping not only the platform but just how customers are gonna interact with it going forward? Sujay Solomon: Sure. One of the challenges that we’ve had over the past decade with the platform is since it’s closed source, folks have been able to improve the accessibility of our platform to the level that some of the other platforms have achieved. And that’s starting to become an issue because when you look at, just take for example DevOps tools. Things like, I think they use integration tools like Jenkins or build tools like Gradle, Gulp, Ant, Maven. These are now becoming synonymous with software development. Not necessarily tied to any platform. You could build software that runs on Windows or Linux or maybe even different distributions of Linux. All of the software that runs on those different platforms can be built using the same build tools, can be managed using the same pipelines. The fact that it’s a little bit of a challenge to integrate Mainframe into those standard tools that are becoming prominent in the software industry, that is a problem. And I believe with the initiative that we announced at SHARE called Zowe, our intent is to really, not necessarily solve that entire problem. But kickstart an openness to the platform. And start building some infrastructure that would allow the community of users and customers and individual developers to really start building integration into these open tools that are available. And are becoming very popular with developers in general. But sometimes I say that we’re trying to make Mainframe just another platform. But obviously we’re not trying to reduce the scalability, availability, security or any of those great aspects of the platform that we have. Just add to it by making it more accessible. Steven Dickens: Yeah, that’s interesting. I think open source brings a lot to that. I mean, what’s your view on how that community’s gonna build around something like Zowe? Sounds like a strong focus on the technology but if you give me the community perspective, what do you think that community engagement’s gonna bring to a network like Zowe? I don’t particularly see this as a business advantage for me, just keeping it to myself. And I don’t even want to maintain all of it myself. Maybe I’ll just up in the open source foundations, GitHub, and a lot of others might start using it. And they may even start enhancing this utility that you shared yourself. And you might reap the rewards of you open sourcing it because others are enhancing it and you’re now able to take advantage of what other folks are building in their tool that you shared. That is really what we want to build and promote and nurture. Is build that community around the platform where folks feel comfortable sharing their tools, sharing their ideas so that the platform as a whole can grow. Without having to go through a lot of process and influencing say just a couple of vendors and improving it. Steven Dickens: Yeah. And I think I certainly get the perspective that that kind of crowd-sourced community development is where the industry’s going. We’ve certainly seen that explosive growth of the model for how code is developed. And it’s really interesting for me to see that increasingly coming to the Mainframe platform. As you say, not moving away from the performance availability, security, but adding to the platform. And just making it not only able to play nice with others as part of a DevOps type framework. But also just harness the community, harness that crowd to develop on the platform. One of the questions I’m gonna ask and get you ready mentally for this Sujay, so this one’s gonna challenge you. Where do you see things 18 months, three years, five years out for the Mainframe platforms? You look ahead and into that crystal ball, where do you see the platform going? Sujay Solomon: Well, seems like things have come full circle. When I was in college, mid-2000s and maybe even before that, there was a lot of talk that Mainframes are going away. We’re gonna try to migrate everything to the cloud. That sort of thing. But what I’ve noticed recently is actually kind of a reinvigoration of interest and commitment to the platform from a lot of companies. Because they seem to have realized that there’s quite a few aspects to the Mainframe that are, that really cannot be replaced by anything else. There’s also a lot of investment that has gone into the platform. There’s, I mean, think about the 30, 40 plus years of business logic that’s been written and enhanced and refined over these years. Why rewrite that? Why move that somewhere else if you can make what’s on the Mainframe highly accessible and open? So that you’re not inhibited by the platform when it comes to innovation. That’s key, is that we need to be able to drive innovation on the platform. It can’t just be a platform that is kept maintained well. It’s gotta be a place for innovation. And I believe that that’s starting to happen. Today I think folks at larger organizations are just accepting and realizing that the platform is not going away. And they’re starting to reinvest in it. I’ve even heard that some of them are even moving non-traditional workloads. Things like Java workload or an OJS workload from other cloud platforms into the Mainframe platform. I think next year, or maybe a couple of years from now, we’re gonna see more of that. Where maybe there’s an application that’s running somewhere in the cloud that’s not meeting SOA. And the data that that application interacts with is actually on the Mainframe. Those types of applications, if we make it simple enough for, say, a web developer to deploy a web application to the Mainframe. The same way that they can use something like a COI to deploy to another cloud platform. As long as we make it as simple and as accessible I believe Mainframe is now gonna start taking a spot when it comes to enterprise architecture where they consider different deployment platforms. Mainframe needs to be considered as one of the options there and I believe that is starting to happen. Steven Dickens: Yeah, I think we share a lot of the same views, Sujay. I think I see an exciting future ahead. And some of the work that you guys are doing around Zowe and the open source collaborative piece is only just gonna help that. One final question as we look to wrap up our time today. The format of this is I’m a Mainframer. What would you say to yourself back as you were leaving college, if you could do that, around the platform? How would you energize the college kids graduating this year to get into the platform and follow your path and become a Mainframer? Sujay Solomon: That’s actually a tough one. I really liked what Penn State did for me. They did not teach me a hell of a lot about specific languages or specific platforms. I learned concepts. Just normal programming concepts, computing concepts, hardware concepts. And I was able to take those concepts and I picked a platform that I thought was viable and long standing and that had an important place in today’s businesses. And for me there’s really nothing better than Mainframe data when it comes to longevity and stability and importance in the real world. That would be my advice, then, to keep your options open. Look at the platform and try to understand why it really is, plays such a key role in today’s economy and in various industries. And the skills you learn there are transferable to any other platform if you ever get bored and you wanna move around like I did. Options are always there for you. Steven Dickens: That’s fantastic. I think that’s really good coaching. I think the Sujay of 22 years old would have appreciated that type of insight. Thank you for that. Sujay, this has been fantastic today. Really good to get your perspective, really good to get a view of where you’ve grown as a Mainframer. Your initial experience at the platform. Your perspective of where we are right now with some of the things that are happening. And just that looking ahead and that view 18 months, three years out of where the platform’s gonna be. Thank you very much for your time today. Sujay Solomon: Thank you, Steven. Steven Dickens: This is Steven Dickens signing off. 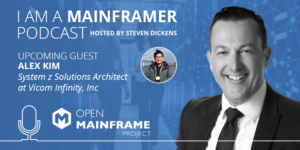 You’ve been listening to the Open Mainframe Project I’m a Mainframer podcast. Please look forward, please look for us and join us next time. In this interview Jeff chats with Tuan Hoang. 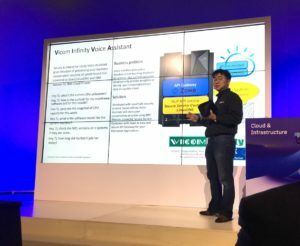 Jeff and Tuan talk about value of Alpine on the mainframe. In this interview Jeff chats with Mike Friesenegger. Jeff and Mike talk about value of Linux on the mainframe. In this interview Jeff chats with Misty Decker. Jeff and Misty discuss how she introduces young people to the mainframe. In this interview Jeff chats with Chad Rikansrud. Jeff and Chad discuss the biggest challenge for the mainframe going forward.